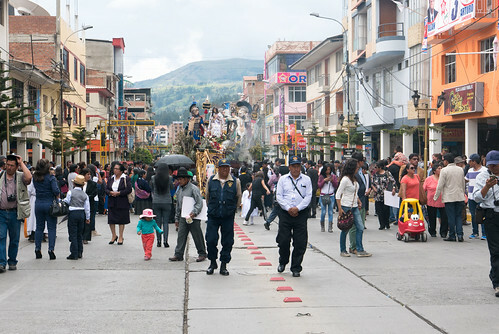 Huaraz - the city of beeps. Cars beep at everything here, whether it's taxis spotting that you're clearly a tourist and therefore must want ferrying everywhere, or normal drivers honking in place of indicating, or even stopping. You'll be hard-pressed to go a full minute at night without hearing a horn, and that drops to fifteen seconds in the day. You'd think it would fade into background noise after a while...it doesn't. We left David, Eugenia and Nuna at 11 and spent almost a full day on the bus. 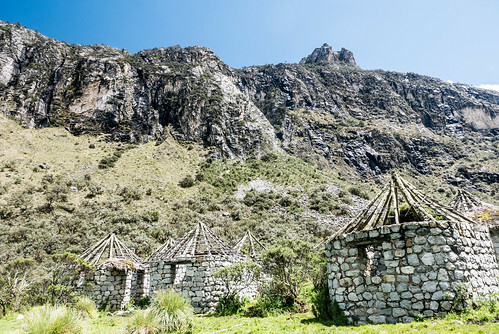 Huaraz is about 3000m above sea level so it's advisable to stay there for a day or two before hiking to avoid altitude sickness; on the bus a Peruvian lady told us she always felt the effects but didn't have any sorochi tablets, so we gave her some ibuprofen. We arrived characteristically late in the city and decided to hike it up to our hostel, ignoring the persistent cabs trying to get our attention. Ezama hostel was the top pick on TripAdvisor and came at a bargain price to boot. We ran into problems immediately though when the owner Emilio claimed not to have our booking. After trying to shunt us into a room with two bunk beds I stood my ground, and after five minutes of explaining that we'd booked two days earlier, a double room magically became available. It was 10pm and we were a little peckish so took a walk a few blocks down to Mi Comedia Pizzería where we had pasta and fantastic Argentinean red wine along with some of the best service I've ever experienced at a restaurant. The owner was lovely and even featured on a painting, clearly having worked in the kitchen in her earlier days. 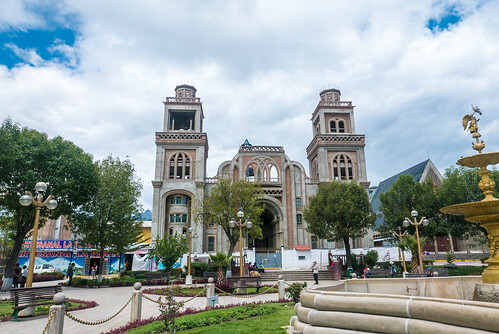 We decided to spend the next day acclimatising and exploring the city, as well as trying to find travel agencies that would offer us day tours. We hadn't banked on the fact that Easter was one of the main times of the year for Peruvians to take holidays, so two of the agencies I'd looked into were closed (well, one was, the other was nowhere to be found so was presumably locked behind shutters in a nondescript location we'd wandered past). After watching a random parade, we did some research over beers and lemon pie and found another recommended place which was actually open. 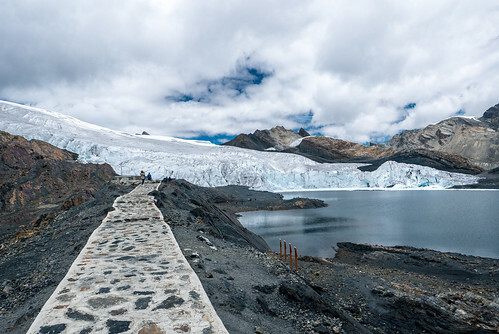 Once again, the holiday period took effect and meant that prices were hiked up (thanks, Jesus) but we booked onto a trip to Pastoruri glacier for the following day. There really wasn't much else to see in the city - it's dirty, full of fumes, and has its fair share of unfriendly dogs - so the afternoon was spent wandering the local markets, buying lunch for the next day. Back at the hostel we booked flights in and out of the Galapagos, no thanks to the LAN airlines website, which is possibly the most unfriendly user experience one could wish for. They refused to accept our debit or credit cards, and even the usually reliable PayPal gave up, so we followed suit and eventually managed to get tickets through BudgetAir. It also seems that the more times you search for the same flights on Skyscanner, the more the prices increase. It's a pretty shady operation. Still, an important part of our trip was now booked in, which was a relief. We celebrated by having a curry at Chilli Heaven - imagine our surprise to find that one of the waitresses working there was Nelly, the lady we'd given ibuprofen to on the bus the previous day! I was feeling brave and given that South America had been notoriously lacking in spice to date, I decided to order a vindaloo. I'd never ordered one in a restaurant before, especially not England; madras is normally what I'm most comfortable with, but given the tameness of the heat I'd experienced to date I didn't think it'd be a problem. I wouldn't necessarily call it a mistake as it was perfectly cooked, but it had the same level of heat as a UK vindaloo. Gilly spent the evening laughing at me over her rogan josh whilst I wiped away eyelid sweat. Thank goodness we'd ordered a litre of pisco sour to help my mouth. Whoever orders a phal from there is clearly insane. 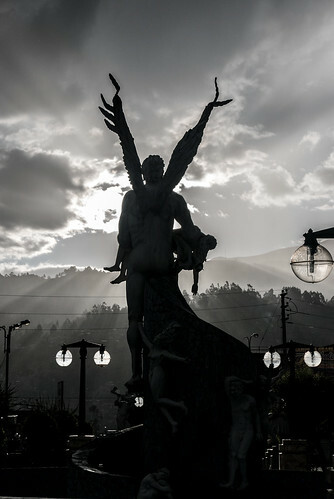 We had to be at the Quechuandes agency for 9am the following morning for no practical reason, since we then spent forty five minutes sat on a bus before returning back to our start point. Still, we eventually got going and just after eleven we arrived in the Pastoruri national park. 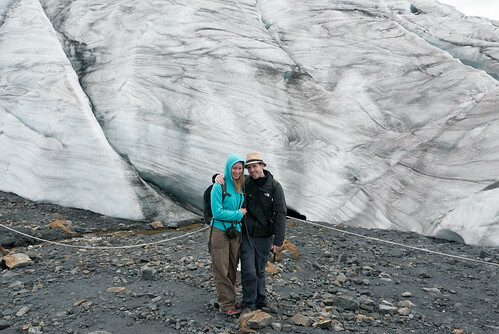 There were a few stops before we got to the glacier. 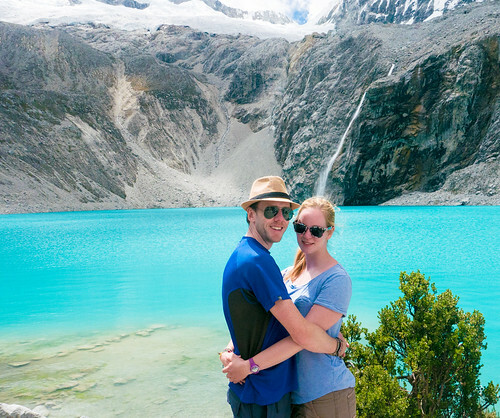 The first was to see Laguna Patococha, a lake with some ducks on it. 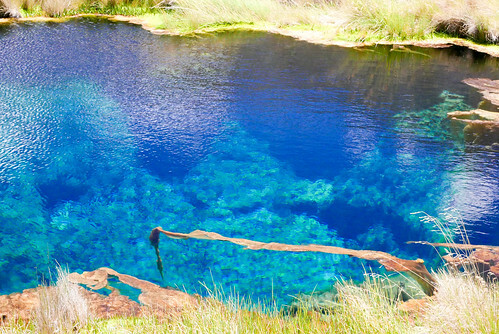 Next up was a slightly more interesting mineral pool with naturally gassy water bubbling up to the surface. 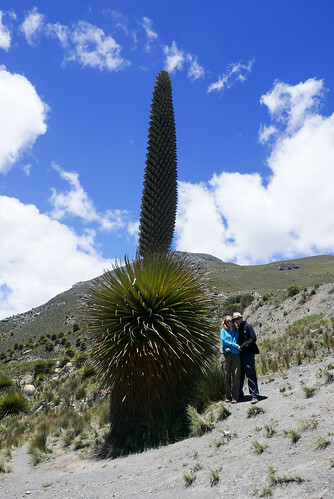 From there we went on to see Puya Raimondi, huge bromeliads which grow up to fifteen metres tall. 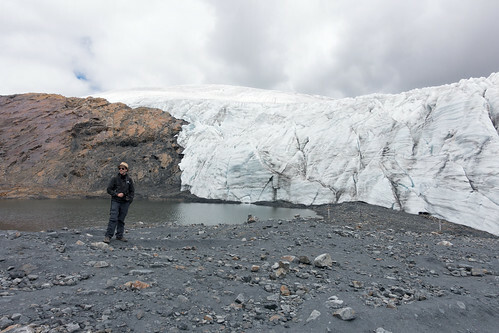 Our guide only spoke Spanish which was a significant test of our schooling, but the general gist was that the Pastoruri glacier used to be huge, but has been devastated over the years by climate change and global warming. This was evident when we actually reached it after a forty minute walk from our final drop off point. 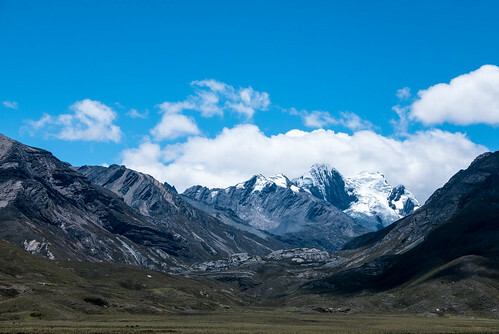 The dramatic surroundings of the ice-covered Cordilleras Blancos overlooked the Pastoruri glacier, but even they have suffered from the planet's heating: a sign mentioned that in the last 33 years the mountains have lost over 27% of their snow cover. 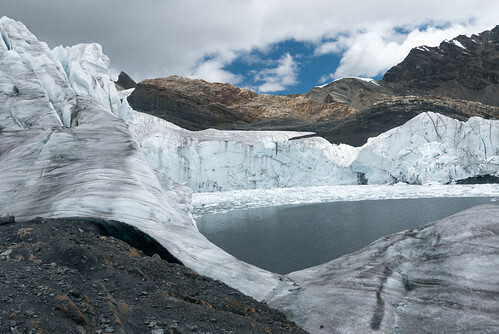 The glacier has fared even worse, since the path we took to reach its edge went through a rock bed that used to be underneath it forty years ago. 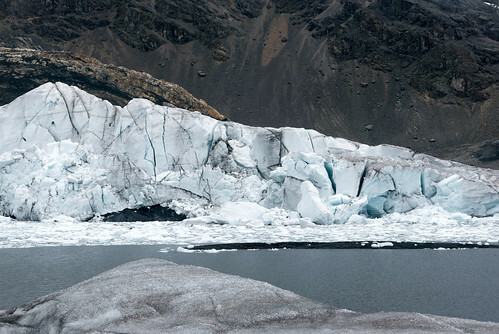 At current estimates, Pastoruri glacier may not exist by the end of the decade. When we reached across to run our fingers over its surface, we were touching a piece of history; a poignant reminder of the damage we do to our environment. 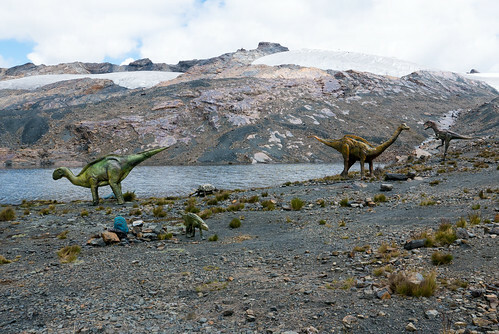 For some reason, the park also includes a small dinosaur exhibit near a tiny lake. I had no idea why, but I love that the Spanish for them is "dinosaurios". 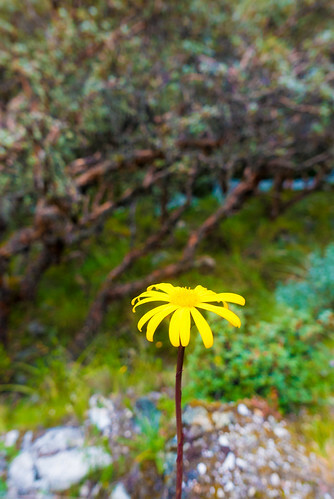 While the walk to the glacier was a little tough due to the altitude (over 5000 metres!) 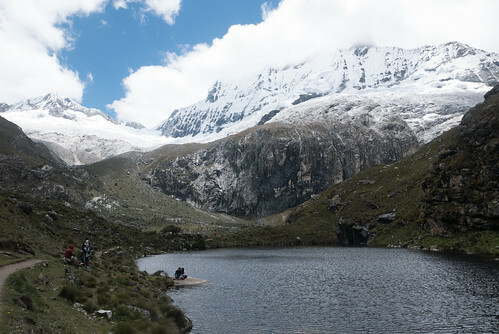 and thin air, the walk back was (for me) not particularly pleasant since the vindaloo I'd eaten the previous night had decided that the ideal time to make its presence known was when we were 2km from the nearest baño. Thankfully I was able to control the situation enough for me to hotfoot it back to the entrance. I've never before felt like I've got so much value out of 20p. I'd like to say I was more sensible at dinner that evening, but we went back to Mi Comedia Pizzería to try their pizza this time, and I ordered the picante which came with rocoto peppers. 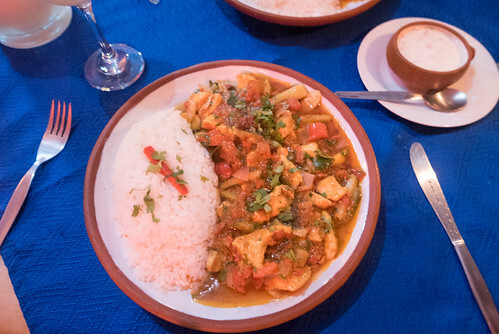 These were far spicier than the tame ones we'd had in Lima, and it was my turn to laugh at Gilly as she struggled to cope with the heat. Still, a bottle of Sprite and Inka Cola (a poor man's Irn Bru, but oddly addictive) took the edge off. I had booked us onto a trip to Laguna 69 for the following morning. We left at 6:15 (half an hour after we were due to, natch) for a three hour bus ride to the park. En route we stopped at Recreo Campestre "El Granero", where we tried and failed for thirty minutes to get breakfast before eventually making do with a juice and a crap cup of coca mate. We had another couple of stops at other lakes before reaching our destination. Laguna 69 isn't the actual name of the lake. 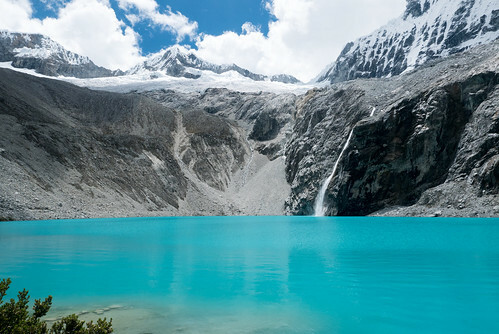 There are around 435 lakes in the area, and this one just happened to be given that number; others have been given Quechuan names, but since 69 wasn't discovered by Quechuan people when the survey of the lakes was carried out, the name stuck. 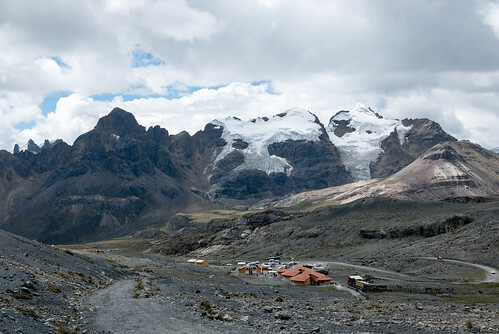 It's 4400 metres above sea level, not as high as the previous day's trek, but significantly harder work. 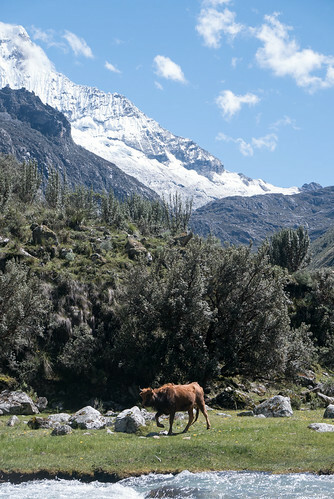 The journey up to the lake started off easily enough, along some fields with very curious cows, over a few streams and up a gentle incline alongside a mountain. Things soon got a lot tougher though, as the path got much steeper. 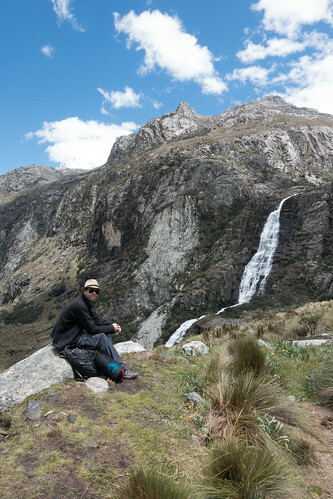 The altitude took its toll on Gilly who found it much harder than both Colca Canyon and Machu Picchu. For me, I think the previous day's walking had helped me acclimatise a lot and I was happy to march on. That said, eating lunch near the top of the mountain was a good move for all concerned and when we finally created the ridge to see the lake, it all felt worthwhile. 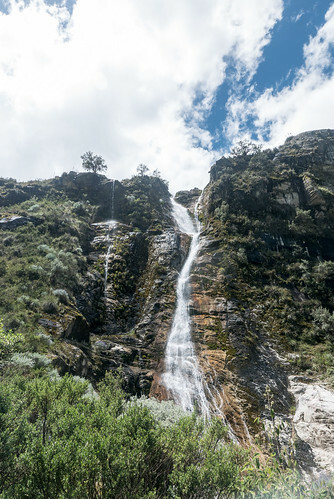 The difference between the stark icy landscape of the previous day's glacial valley and the lush, waterfall-filled greenery of the park couldn't have been clearer. Hiking back down was much easier, although we were a little behind on time having been told to get back to the bus for 4pm. After hurtling along at a significant pace we got there at 4:15, only to find we were the fourth people in the bus. We then had to wait a full two hours more for everyone else to get their arses back so we could actually leave. Pissed off does not begin to cover it. 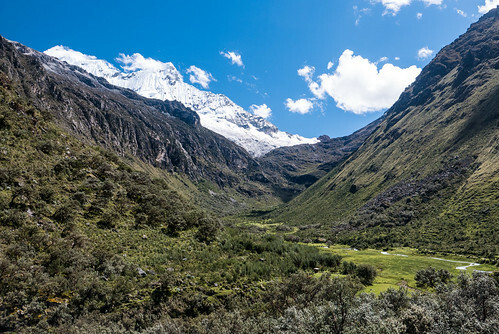 Thankfully we hadn't booked a bus for that evening, instead deciding to get one the following morning; if we had, it'd have been long gone by the time we returned to Huaraz at 9:15pm. Tired, damp and with the onset of colds kicking in, we were lucky enough to find Café Andino still open for Thai curry and a salad. Back at the hostel we got packed up and collapsed into sleep ahead of an eight-hour journey up north.